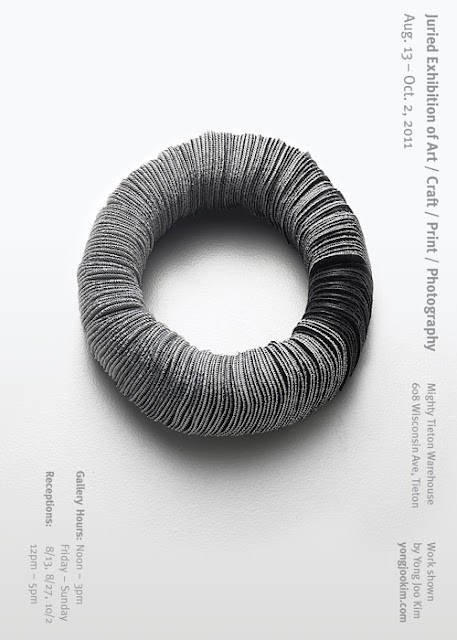 Yong Joo Kim's 2011 Body of work to be showcased at the 2011 Fiber Art Fair in Seoul, Korea. The Sookmyung Women's University's Fiber Art Alumni Association has invited Yong Joo Kim as one of the solo exhibitors at the 2011 Fiber Art Fair taking place at the Seoul Art Center's Hangaram Art Museum in Seoul, Korea from 11/22 to 11/30. Yong Joo Kim's 2011 Body of work explores the concept of inner-beauty by investigating the relationship between the process of exploration and trust endowed to a material by an artist. The body of work is a development of her thesis work at the Rhode Island School of Design (RISD), where she let go of her usual repertoire of precious metals to explore the world of unnoticed yet beautiful objects. Through this processes, she witnessed--over and over again--that no matter how mundane or insignificant a material seems at first, as long as the process of exploration began with a firm belief in its potential, she was eventually surprised to uncover its hidden qualities that she did not know existed. FAF was founded to establish a broader platform for communication between artists and the interested public and to promote the vitalization of the Korean fiber art market. The 2011 Fiber Art fair is a follow up to the 2008 Fiber Art Fair organized by the Sookmyung Women's University's Fiber Art Alumni Association. This year's Fiber Art Fair brings together a total of 27 solo artists ranging from emerging to well-established artists. Seoul Arts Center is a cultural center in Seoul built with the mission to better promote the Korean arts and cultural, and to also raise awareness of the Korean arts to the international level. The center consists of the main Festival Hall, Calligraphy Hall, Music Hall, Arts Center, Center of Archives, Education Hall which are all housed indoors, and the Circular Plaza, Street of Meetings, Traditional Korean Gardens, an outdoor Theater, and a market place. The Hangaam Art Museum, measuring in 15,434 m², opened its door in 1990 to concentrate its efforts to sharing the modern and contemporary art with the public. Hi everyone! 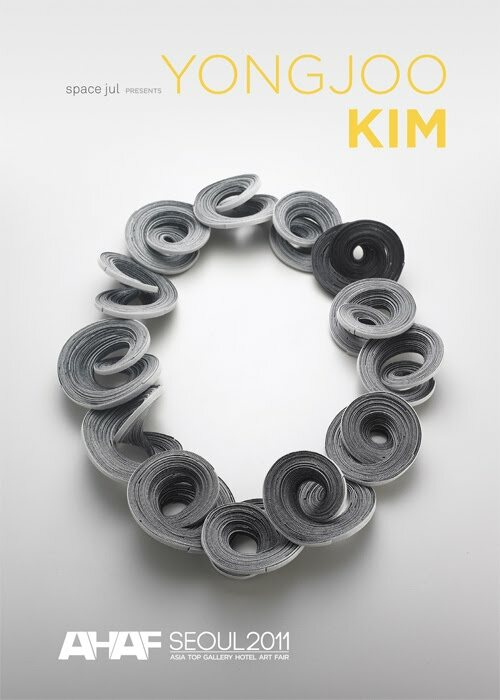 I'm back in my home town of Seoul, Korea to partake in The Fiber Art Fair . The fair has just begun, and I have been busy spending the past few days installing my 2011 body of work titled Reconfiguring the Ordinary. It has been a wonderful experience thus far seeing what goes into putting on a solo exhibition. It's been a non-stop whirlwind of activities here in the past few days. Here's a program I had to quickly get out the door for distribution at the exhibition. If you happen to be in the city of Seoul, please come by and check out the exhibition! Last Thursday, I gave a lecture to a group of jewelry students at Rhode Island College (RIC). I was a guest artist invited by Dianne Reilly, the head of the Jewelry department at RIC. In the beginning, there were a couple technical problems with the projector, which made me very nervous. But Luckily, it worked out eventually. Flustered, I took a deep breath, looked around the room and started my presentation. After a couple minutes, my breathing went back to normal and I was able to make eye contact with one of the students. I was not sure whether I was doing well or not. But when I got a few more eye contacts with different students, I regained a sense of confidence to keep going. My presentation took around 30-35 minutes. Afterwards, we had time for questions and answers. Surprisingly, several students put their hands up. I started to answer the first questions. After my answer, the students kept asking me more and more questions. Everyone seemed to listen very careful when I made eye contact with them. Some of the questions were very interesting and thoughtful. I didn't realize how much time we spent while I was answering their questions. By the time we wrapped up, I realized that 30 minutes had already passed. Having many questions about me and my work was highly encouraging. I felt that I actually communicated with them and they understood my story. It gave me a positive energy to keep working forward. After the Q&A, I met with 9 students individually to critique their work. It was very interesting to have discussions with them. While I was meeting with one of the students, she told me, "I really got a lot from your critique. I am glad to have a fresh perspective on my work!" I was also very glad that I was helpful. It has been two years since I finished my graduate program. After graduation, there were not many chances to present my work or to review other people’s work. I am so grateful to have this opportunity. My schedule has been very hectic with shows and events happening through the end of the year. I have been meaning to write a blog post and the lazy me has finally gotten around to it. Apologies for my tardiness. A couple months ago, I received an interview request from Marcello who is the founder of Japan Cinema. Japan Cinema is a 3-part lifestyle project that houses both film reviews, an online-magazine, and artist interviews. It acts as a natural expansion for movies, art, and Asian culture. I was very impressed with all his interesting questions, and I wanted to share some excerpts from it here on my blog. If you'd like to read more, please visit here. Japan Cinema: Do you believe that having an outsider perspective, having grown up in Korea, given you any advantages in acquiring an unique perspective approaching towards art? Yong Joo: I think having an outsider perspective from Korea isn’t an advantage per se. I think what matter is that you put yourself in a place of deep contrast. Since I had experiences living in both Providence and Seoul, I was able to compare and understand what the difference is. This was an important key to reﬂecting on my life and my art work. I think our life is like a train travel. As soon as we are born, we are put on a train which is headed somewhere unknown. However, if we want to see what kind of train we are on before we get to the ﬁnal destination, we need to get off the train at a rest stop for a moment. Then and only then will we be able to gain a perspective on what train we are on, where we have passed by, and where we may be headed to. In other words, it helps us become aware of our past and the present. Also the awareness of the past and the present works like a compass that allows us to guess where we may be headed in life, even though the future may be vague and uncertain. Changing my environment and culture has given me a moment to take a break, to get off at a rest stop. It has been a great opportunity to reﬂect on my history and life by stepping out of my familiar environment. I’ve been traveling so fast with the train, and never had a chance to really think about how I was living my life. Japan Cinema: Would you recommend a creative to go to a formal college to further their career in this day & age? Yong Joo: That’s a difﬁcult question. The advantage of a formal college is that we could study in depth our chosen ﬁeld. In order to do that, it requires that we need to have a motivation, passion and interest in that chosen ﬁeld. However, the problem is that our students often enter school without knowing what they are interested in or what they want to do. I didn’t go to undergraduate school in the U.S so it is hard to comment on the education in the U.S. However, from my experience in Korea, competition was a major theme that stayed with me while I was a student. Me and my friends suffered a great deal of stress due to the competitive and rigorous college prep environment in order to enter to prestigious university. Because the majority of my peers believed that scoring high were the only way to gain recognition in society, my peers decided to choose their major based on standardized test scores and they didn’t know what they are really interested in. I saw many colleague and friends who felt lost because they were not interested in their major. These days, the majority of college students try so hard to attain qualiﬁcations in order to get a successful job before they graduate. I believe that each individual life is unique and creative. However under the current education system where the middle and high school has been standardized, each individual often becomes uniformized. It is more important to ask yourself and ﬁnd out your true passion about what you are interested in, what you want to do with your life, and what you want to study,instead of wondering whether or not to go to college. When I came to study abroad at RISD, I had an opportunity to observe the freshman year students. I felt that a lot of them had great passion for their dream and had entered school with a lot of preparation. It was quite impressive. I think passion is a source of power that helps you overcome a lot of difﬁcult tasks and workloads. Without it I think it would be very difﬁcult to make it all the way through art school without becoming jaded or loosing interest. 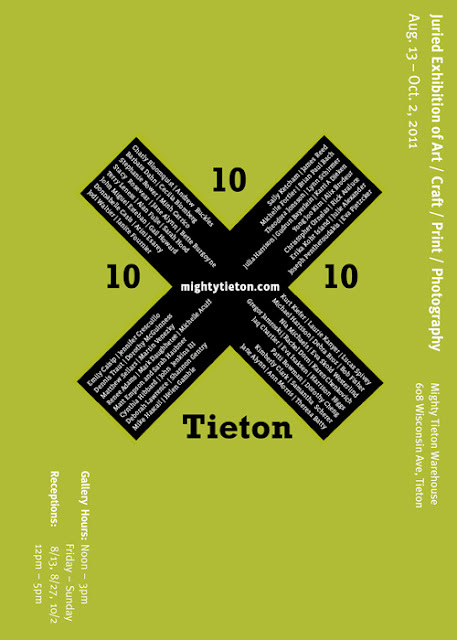 Soooo I will be participating in the 10 × 10 × 10 × Tieton, a juried exhibition of Art, Craft, Print, and Photography!!! :D It's an event that features work no larger than 10 inches in any dimension taking place at the Mighty Tieton Warehouse, 608 Wisconsin Ave., Tieton, WA. 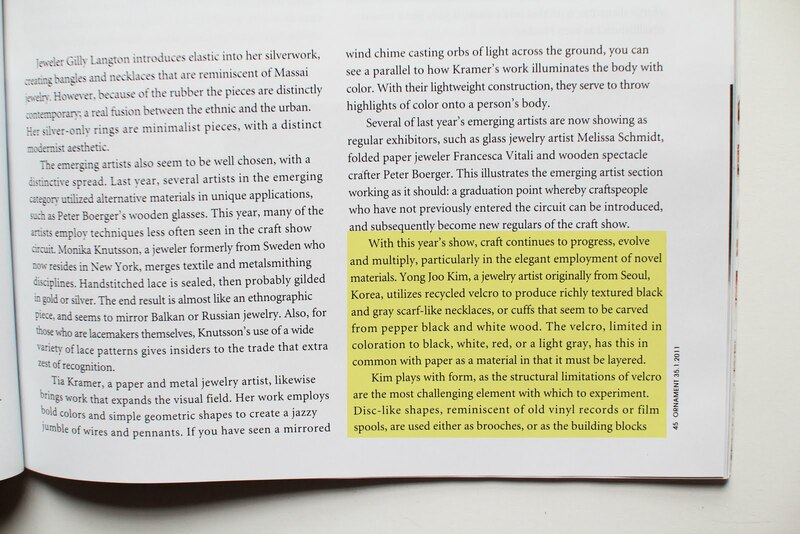 김용주작가의 2011년 작품 "Reconfiguring the Ordinary"의 일부가 스페이스 줄의 초대로 오는 8월말 하얏트 호텔에서 열리는 아시아 탑 갤러리 호텔 아트 페어(AHAF 2011)에 전시될 예정이다. 김용주 작가의 작품은 우리가 우리 자신의 보이지 않는 특성을 믿고 그것을 발견하는 과정을 통해 비로소 경험할 수 있는 숨겨진 아름다움, 그리고 그에 따른 놀라움에 의미를 두고 있다. 그녀는 로드아일랜드 디자인대학원(RISD 리즈디) 논문 과정을 수료하던 중 아무리 일상적이고 사소한 재료일지라도 그들만의 특성이 있으리라 믿고 그것을 발견하려 노력했을때 비로소 그들에게 존재하는지 조차 몰랐던 특성들이 발견된다는 사실을 연속적으로 경험하게 되었다. 그리고 그런 경험을 통해 깨닫게 된 소위 탐험적 작업방식(Process of Exploration)을 한층 더 발전 시켜 이번 작품에 반영하였다. 값비싼 금속에서 벗어난 그녀의 비관습적인 재료 선택과 작업방식은 관습에 지나치게 얽매여 있는 근대 사회에 새로운 관점을 제시하기도 한다. 스페이스 줄은 주얼리 작가 및 디자이너들에게 보다 나은 작품개발을 위한 주얼리 트렌드 및 정보를 제공하고, 디자이너들 간 정보 공유의 기회를 마련해주어 왔다. 또한 온라인 상에서 작가 및 디자이너 작품의 전시 및 판매가 가능하도록 장소를 제공하며 고객과 작가들 간의 소통의 장을 열어 주었다. 이런 노력의 일환으로 스페이스 줄은 이번 아시아 탑 갤러리 호텔 아트페어에 참여하게 되었다. 아시아 탑 갤러리 호텔 아트페어는 아시아 미술계의 교류와 활성화를 도모하고자 Asia Art Net Committee의 주최로 2011년 8월 19일(금)부터 21일(일)까지 Grand Hyatt Seoul에서 제 6회 개최를 맞이하게 된다. 한강과 남산을 끼고 도심 속 리조트를 이미지화한 그랜드 하얏트 서울의 객실 84개를 이용하여 한국, 중국, 일본 등 아시아의 70여 우수 갤러리들이 모여 3일간 펼치는 당 아트 페어를 통해 아시아의 현대 미술을 한눈에 둘러 볼 수 있는 기회가 될 것으로 예측 된다. 그랜드 하얏트 서울의 현대적이고 럭셔리한 객실을 활용한 다양한 특별전과 VIP PROGRAM를 통해 아시아 탑 갤러리 호텔 아트 페어는 하얀 벽으로 둘러싸인 여느 전시와는 색다른, 특별한 경험을 관람객들에게 제공하려 한다. "Reconfiguring the Ordinary" at the Asia Top Gallery Hotel Art Fair (AHAF). artists and the interested public. AHAF is an event hosted by Asia Art Net, to promote the vitalization of the Asian art market. 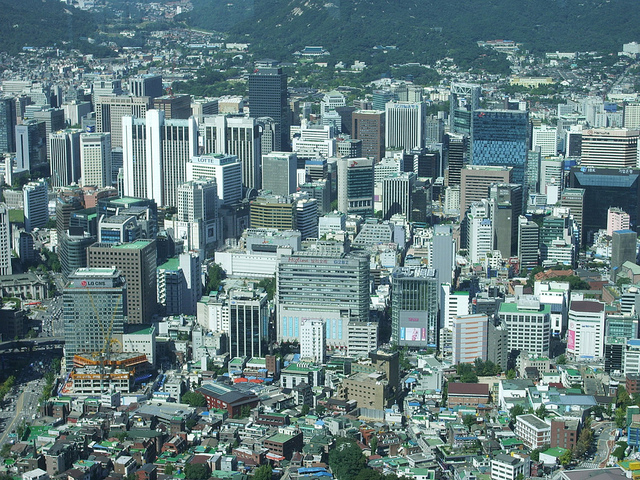 AHAF was previously held at The Grand Hyatt Seoul in 2009 and 2010 to great success. 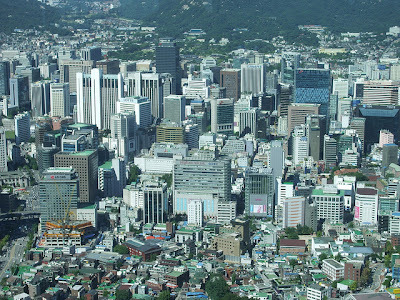 This year, AHAF Seoul 2011 will once again be held at The Grand Hyatt Seoul from August 19th to August 21st. AHAF is an event that takes place inside hotel rooms instead of the typical white walls of the modern gallery. Viewing the artwork situated inside hotel rooms, one can more easily approach a piece of art when compared to the stern setting of a modern gallery. Moreover, it familiarizes the experience by helping interested buyers imagine the artwork as situated in their own residence. 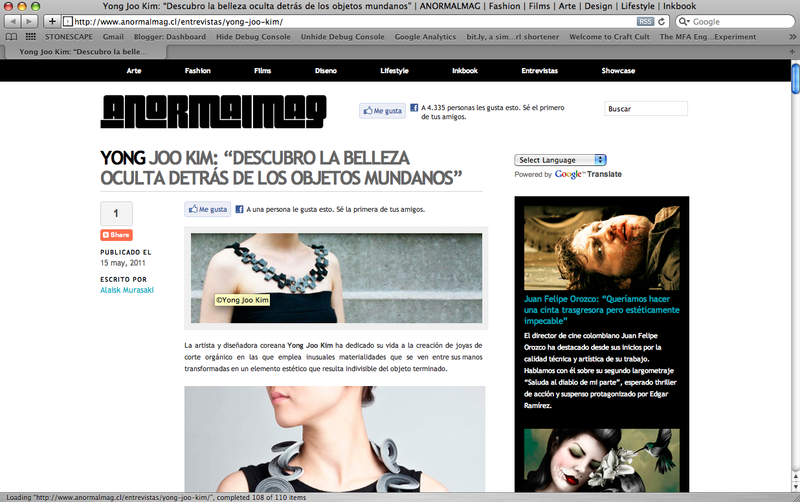 AHAF Seoul 2011 will occupy 84 hotel rooms, and showcase 4000 artworks in one place. The event is sponsored by the Ministry of Culture, Sports and Tourism, Art Council Korea, City of Seoul, Seoul Foundation for Arts and Culture, and Korea Tourism Organization, in addition, cooperation of Grand Hyatt, Hyundai Department Store, Ferrari, Guerlain, Vacheron Constantin, Korea Securities Finance Corp., Pernod Ricard Korea, Villa M, Pilsner Urquell, Perrier, FedEx, Sinwa Shipping, and Goldmund. A couple days ago, my friend gave me this article link from the New York Times. This article reports that four students and a popular professor at the Korea Advanced Institute of Science and Technology, known as KAIST, had committed suicide. I heard about this news from Korea a while ago and I am so sorry to hear that they chose to commit suicide. It's a very critical moment so I wanted to share this article with all of you. The article also talked about unhappy young South Korean students and the reality of the education system in South Korea. 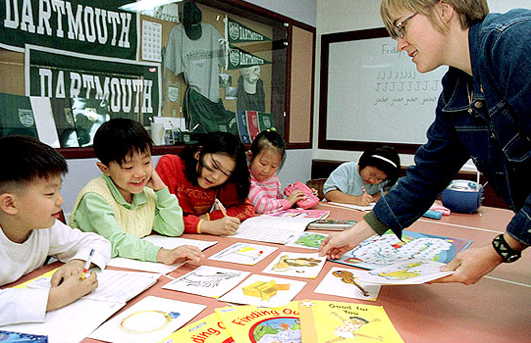 According to the NY Times, "The competition for a place in a leading university begins in middle school for most South Korean students. More than 80 percent of Korean young people go to college, and parents here spend more money per child on extra classes and outside tutoring — including military-style “cram schools” — than any other country in the O.E.C.D." 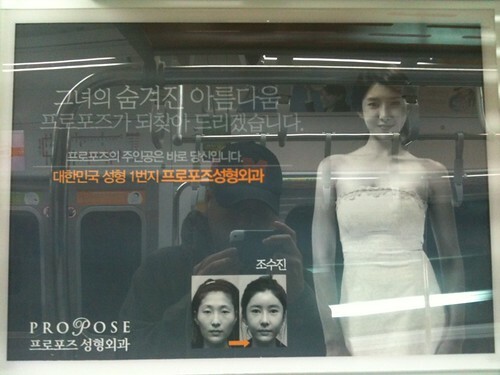 Competition was a major theme that stayed with me while I was a student in Korea. The competitive nature of the school necessitated examinations in subject matters as broad as mathematics, sewing, piano performance and drawing. My society and my training demanded that I excel at all of these tests. After each exam was graded, most students would ask around for each other’s grade to see where they ranked. The majority of my peers believed that scoring high were the only way to gain recognition in society. There was not much evidence to believe otherwise. To make things worse, these days I think the competition for a place in a leading university does not begin in middle school for most South Korean students. I would say that it starts at a very young age like 3 to 5 years old because they need to study English so hard to be able to speak English like their first language. The images is from http://blog.naver.com/hye801?Redirect=Log&logNo=140127818279. Last saturday, I went to see the RISD collection, which is the Apparel Design Department’s popular fashion show. My first time to see the fashion show was 3 years ago! Time flies!!! I got the ticket so late so it was not the best seat but it was worth watching!! It was especially interesting to see some of the selected collections that were made from recycling materials like burlap, feathers, gears and tapes etc. I guess those garments were created in response to the Re- Innovative Design class where students explored the properties of recycled materials other than fabric while creating a wearable piece. The Re-Innovative Design class reminds me of the New Jewelry class that I taught last year. It's always interesting to see how the raw materials transform into unexpected and beautiful pieces. Here are some images from the collection 2011. My favorite pieces from the senior collection are shown below. I like the color combination of grey, red and mustard color! : )I can't remember the artist's names. Sorry about that! Also, the green color collection was wonderful! A couple weeks ago, I got an interview request from NORMALMAG. NORMALMAG is an alternative electronic journal offers a varied and demanding audience, themes that aim to entertain and encourage debate onthe ever-changing world of creativity. Here is the interview transcript in English. Q. What caught your attention to the jewelry as a concept and ability to implement all of your artistic talent? A. Magdalena Ringels states, “What is so wonderful with jewelry is that it has a public arena beyond the white-washed gallery walls. This is something that few other art forms have.” I feel privileged to be able to create work that can become so intimately involved in the wearers’ everyday lives. Q.The silver work was your starting point ... right? A.That's right. In college, I fell in love with the idea of being able to make well-crafted and beautiful objects made from precious metals such as silver. I knew I had a passion for it, because despite it being such a long and difficult process, I always had the energy to follow it through to the end. Q. Do you feel that your spirit both artisanal and your aesthetic sense are rooted in your college education? A. Absolutely. The graduate school gave me the opportunity to take a holly different perspective on the world, which has had a profound impact on my work and my creative process. A. Culture and environment are now my greatest inspiration. Q. How is it that nature has become the real background of your project? A. When I was little, I was surrounded by all sorts of different rocks my dad collected from traveling to rivers and mountains. I followed him on these excavations, and you can visibly see how the aesthetics of these experiences get reflected in my work. Then in Providence, my surroundings were filled trees full of leaves in the summer, which were then left bare in the winter. You can see how these aesthetics are reflected in some of my work as well. A. Sure. My choice of materials comes from the everyday corners of our lives. However, my finished pieces provide the wearer and the audience with an unfamiliar experience. A. When the wearer and the audience recognize a new and unexpected way of looking at material and form, they are given the opportunity to reevaluate the traditional and cultural notion of beauty and value in jewelry, focused on expensive metals and stones. My work introduces unconventional use of familiar artifacts into a world full of conventions. I hope an empathetic relationship between my work and the wearer can be created. A. In the process of searching for my basic shapes, I cut, twist, bend, roll, scatter, gather, attach, detach, connect, assemble, and accumulate. My ability to conduct this search develops and informs the structural form I am making. Similarly, in the 60s, artist Richard Serra wrote a Verb List putting the emphasis of his work on the process and the placement of materials. His method of engaging in an active process allowed me to better explore material with freedom. A. Instead of putting emphasis on the final design, I have come to focus more on the process. My current working process takes a form similar to the way mankind has explored space, caves, oceans, and new terrains. Instead of thinking about inventing or creating an artifact, I have come to understand creativity as a way to search for, and to discover an insight. Perhaps it is an expansive process no smaller in scale than the evolutionary process that occurs in nature. Q. What did you accomplish with your latest collection 2011? A. As an artist I work with objects we encounter everyday that often go unnoticed, such as beans, straws, cable ties, and Velcro. I explore the value of such mundane objects, and discover their hidden beauty through a process of reconfiguration. By assembling, grouping, clustering, and piling, the simple elements become complex, and give rise to the unexpected. As the wearer approaches my work, the experience of perspective shifts and sudden realizations spark wonder, discovery, tension, joy and play. Q. So far your work is experienced only as an object or a series of objects that can be used individually or viewed in a gallery. Would you like to share the process that produces them? A. Of course! 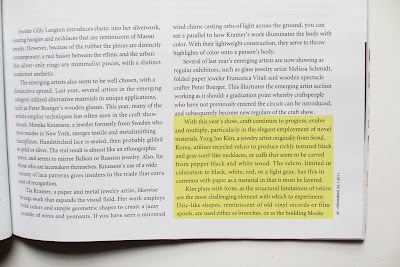 I hope to create a set of sculptural installations with this process as the concept. I wonder what the audience would feel as they experience such an installation. 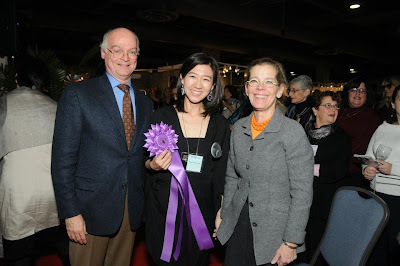 I was pleased to participate in the Pawtucket Foundation Prize Exhibition. Since the exhibition was held in Pawtucket, I was able to attend the opening yesterday. What a great pleasure! It's been a while since I have been to an opening night! I took some photos while the audiences were viewing my art work. I wished all of the art pieces were hung a bit further away from one another. On exhibit is work by Yong Joo Kim, Mimo Gordon Riley, Nancy Gaucher-Thomas, Deborah Baronas, Richard Allen, Roberta Shapiro, Gretchen Dow Simpson, C.W. Roelle, Holly Gaboriault, Lynne Tobin, Bonnie Jaffe, Irene B. Allen, Ruth A. LaGue, Ann Salk Rosenberg, Nicole Maynard-Sahar, Alan Strassman, Marguerite DeLucia Hall, Jillian Barber, Paul Hitchen, Maira Reinbergs, Jay Pendexter, Beverly Silva, Daniel Koterbay, Anne Rogers, and Cynthia Whalen Nelson. Providence, Rhode Island - April 28 2011 - Yong Joo Kim today announced her 2011 body of work titled Reconfiguring the Ordinary. The following is her personal statement summarizing her thoughts behind the new body of work. 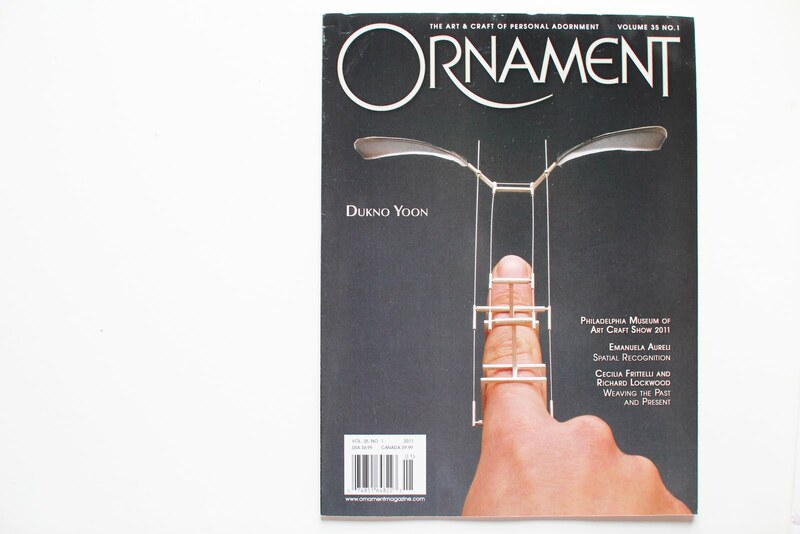 In my previous body of work, I explored the value of mundane objects — such as beans, straws, pins, snaps, cable ties, Velcro and electric caps — and discovered their hidden beauty through a process of reconfiguration. Since I was used to working with precious metals and starting each project with a clear vision of what each piece should look like, exploring and experimenting with a variety of materials gave me a wholly different perspective on both my work and my working process. After graduation, I was left with a limited set of tools and equipments. The limitation of resources made me search for a material that I could shape with my bare hands. The material I chose was pieces of grey and black Velcro. The Velcro attached and detached easily, making it highly conducive to stacking and piling. It was also possible to cut, roll, bend, and sew the Velcro using just hand tools. Its hooks had a sparkling quality, which I was attracted to as well. For the past 2 years, I pushed the limitation of this one material to create hundreds of complex forms. During this time, I noticed that this kind of exploratory process takes on a form similar to that of the evolutionary process found in nature. More specifically, there is a process called artificial selection, which describes intentional breeding for certain traits, or a combination of traits, by human. Within my working process, I use my judgment, aesthetic bias, and imagination to continuously choose and select specific traits of my chosen material to be further developed and accentuated. This becomes the foundational principle behind how new form develops in my work. The artificial selection is generally much faster than natural selection, and it has been fascinating to realize that even in a climate of such limited resources, infinite possibilities can be brought to fruition through this process. A couple months ago, I had an interview with Milk X magazine. Milk X is a high fashion, lifestyle, art and design magazine published in Hong Kong. The April 2011 issue came out. A friend of mine sent it to me from Hong Kong! The only thing is that all of my interview has been translated into Chinese. So I had to ask my friend to figure out what the questions were. Anyway, I am so glad to have a copy of the magazine! Thank you, Sue! Here is the original interview description in English. A. My name is Yong Joo Kim (金容柱 , hangul: 김용주). I am an artist and founder/owner of Sublime Experiment (http://getsublime.com). As an artist I work with objects we encounter everyday that often go unnoticed, such as beans, straws, cable ties, and Velcro. Through a process of co-evolution, I try to understand them for what they are, and work toward bringing out their true value. Q. Is there any difference between your SS11 collection and previous collections? Any breakthrough? A. I have been making continuous improvements to the way I handle my materials. In the latest collection I have begun to pay more attention to comfort. For example, I have been rounding the edges of my Velcro, which smoothes out the edges. This is especially important for bracelets that slide up and down your arm. After I started rounding the edges, I noticed the different kind of texture it creates when stacked. This was a nice surprise, and I was able to incorporate this new texture to come up with new designs. Q. Is there anything you haven’t been able to do yet but would like to do? A. So far my work is experienced as an object or a series of objects. I would now like to communicate and share the process that brought about these objects. I think of this process as being similar to natural evolution. Except that it is more focused (and faster as a result) because of human intervention. I’m interested in exploring this process itself. I hope to create a set of sculptural installations with this process as the concept. I wonder what the audience would feel as they experience such an installation. Would it be similar to that of an archeologist exploring underground caves that came about as part of a natural evolution? What would I learn from exploring this process? I don’t know. I am very curious. Q. How do you work – from sketches etc. - or do you just start the crafting process? A. I start from the crafting process. I find that working directly with materials is the best way to be surprised. This moment of surprise is important for me, because I am constantly trying to go beyond what I know, and what I am comfortable with. I find it hard to be surprised by my own sketches. Q. Can you pick one as the Must Have Item in your SS11 collection? A. I have recently made a new piece called “Mara Mejo”. They are earrings produced as part of my Sublime Experiment production line. It is a piece most people seem to have a comfortable time finding themselves in, regardless of age. Q. Which design or project has given you the most satisfaction? A. In school, I had to make 100 rings in one-week. The project not only got me warmed up, but also helped me learn what it means to have an open-mind. I felt transformed after the project. A. Frank Lloyd Wright. I had a chance to visit his work, Fallingwater, near Pittsburgh in PA. Fallingwater was absolutely beautiful with the integration with the striking natural surroundings. The house is well-known for its connection to the site; it is built on top of an active waterfall which flows beneath the house. I still remember the sounds of nature. It is so vivid. Q. Who/What inspire you most in the creative process? A. The culture and the environment I’m in at the time is the biggest source of inspiration. When I was little, I was surrounded by all sorts of different rocks my dad collected from traveling to rivers and mountains. I also followed him on these excavations. You can visibly see how the aesthetics of these experiences is reflected in my work. In Providence, I was surrounded by trees filled with leaves in the summer, then left bare in the winter. You can visible see how these aesthetics are reflected in some of my work as well. For the last two months, I have been working on updating my website with photographs of my new art work. 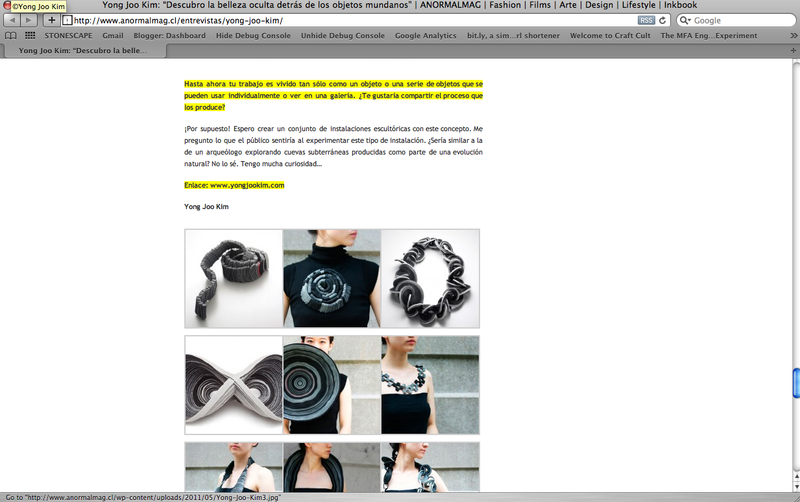 Previously, I designed my website to be browsed in a horizontal way. However, my new images didn't work so well horizontally. Because the object shots were taken at different eye levels, horizontal browsing wasn't so smooth. With my friend's suggestion, we printed out all the images and grouped them according to the eye levels at which they were shot, and placed them on a big white board. As we placed the images on the board, we realized that the eye levels were changing from high to low. This gave us the idea for a vertical browsing design. I have just received some images from the exhibition called "Recontextualizing the Found Object" at the Martha Gault Art Gallery, Slippery Rock University in PA. It is so wonderful to see the installation images with other artists' work. I was pleased to have been a part of the show. Sean Macmillan who was the Juror and the director of the exhibition, wrote "The show was a profound success. We have received great feedback and had a tremendously high turnout." Also he will be able to compile the catalog of the show. That is awesome news! I will be looking forward to having the catalog with all the great pieces. Here are some overview pictures of the installation space. If you look closely, you can see my art work in the center of the image below. It is inside the vitrine next to the brownish piece. It's so small. Here is the bigger version. Here is the participating the artists for the show. I bought this green tea for myself from the O'sulloc Tea Museum in JeJu Island while I was in Korea. You know, I am the only one who take care of my health. So while I was visiting the O'sulloc Tea Museum and watching the roasting process of green tea and tasted it, I felt like the green tea was the most wonderful tea and I had to buy and drink it to get healthy. How funny to have an excuse. : ) So, I brought it to the U.S.
Why I feel like I need to buy something in order to do something? This kind of thoughts recollected my old memories. When I wanted to practice Yoga, I felt like I should buy the Yoga mat. When I wanted to jog, I felt like I should buy the running shoes. So I decided to look around what I have at my place and found these. My tea presentation looks not as good as the tea set. But the taste was so much better than I expected. It's funny to see how my feelings change depending on my attitude. This tea set costs around $500.